Residents of Bristol will be looking to the skies this weekend as the annual Bristol International Balloon Fiesta comes to town, but a new series of videos hopes to use the festival to show the public how much waste is being created by households in the city, and how much recycling potential is lying in their bins. Over 150 hot air balloons will descend, and then ascend, upon Bristol’s Ashton Court estate during the world-renowned four-day festival, which this year runs from 11-14 August. This year the Bristol Waste Company, which manages waste and recycling collections for the city of 430,000 people, hopes to use the Balloon Fiesta to illustrate the amount of resources being wasted by households across the city. To show Bristol residents how recycling, reducing litter and trying to cut down on waste could help the city, a series of videos created by the Bristol-based studio Real World Visuals projects waste and litter collected onto the Ashton Court fields, where residents from Bristol and beyond will gather to watch a number of mass lift-offs this weekend. 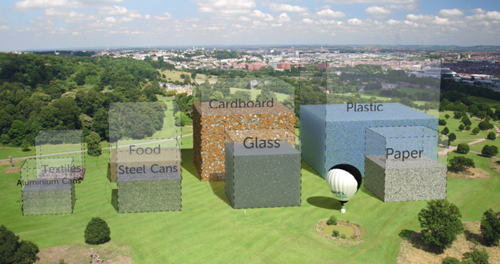 In these videos it's waste, not balloons, that dominates the Bristol skyline. The first shows how one of the balloons that will be seen floating across the Bristol sky this weekend is dwarfed by the amount of litter generated annually – 350,000 tonnes. Another video illustrates how much of each recyclable waste material gets recycled and, vitally, not recycled, using the size of the park to show just how much revenue the city is missing out on through materials not being recycled. Bristol’s recycling rate is currently 46.5 per cent and the films illustrate the ‘wasted opportunity of recycling’. While recycled material can be sold, reprocessed and reused, bringing value to the city in a number of ways, those same materials being put in a bin only bring a cost to the council. Tracey Morgan, Managing Director of Bristol Waste said: “The recycling rate at the Balloon Fiesta last year was a very impressive 86 per cent. We’re committed to working with all Bristol citizens to drive up household recycling rates for the rest of the year too. More information about waste and recycling in Bristol can be found on the Bristol Waste Company website. Bristol City Council has announced that it has ‘mutually agreed’ with its waste contractor Kier to terminate the current waste collection and street cleansing contract. This weekend (24 Jan), Bristol will host an ‘opening spectacle’ to mark the beginning of its year as the European Green Capital.